I’ve gone back and forth about how to get my news each day. I’ve downloaded, uninstalled and re-installed many apps such as CNN, NPR, Fluent News and more! Based on what I’ve seen, the jury is still out. Why? Number one thing I hate is pictures in my news feeds. I want to READ text, not watch videos or browse through photo galleries. I also hate the black background with white text… and yes, I know you can change it but doing so still has not tickled my fancy. GigaOM, one of the many technology sites I follow just posted an article about a 4-week digital-subscription give-away from The New York Times. 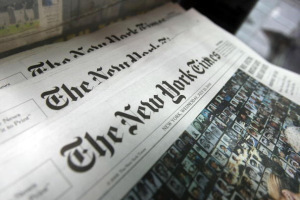 All you have to do is to buy a newspaper on Sunday, November 3rd and you will be able to access The NY Times online and on your mobile phones (tablets are prohibited). I used to subscribe to The Economist and even tried the Daily by Rupert Murdoch, remember that? Historically, I have not been open to paying for news: partly because by the time you read the print version, it’s old news and because (mostly) everything is on the internet everything is free! (or at least there’s a hack for it) I will definitely give the NY Times a try because of this offering but it will be a LONG SHOT to get me to pay for news again. Google the headline. Searches initiated from this search engine allow free access to the story. Use incognito window in Chrome. Basically it deletes the cookies, which keeps track of free reads (limited to 10 or so). Search for the link via twitter. Accessing stories from social media doesn’t count towards article limit. NYClean bookmark. Once you hit your limit, simply click the bookmark and it will instantly unblock it for you. Happy Digital Reading and remember to mark your calendar for November 3rd!